When Jessica and Christopher Morley participate in the University of Maine at Presque Isle’s graduation ceremony on May 12, it will be a family affair. The couple, who are among the 170 students graduating from UMPI this academic year, have been married for 16 years, have been working for the last six years to complete their degrees, and have four children between the ages of 6 and 15 who will be cheering them on as they receive their diplomas. Jessica Morley will receive her Bachelor’s degree in Social Work with a minor in Psychology. Christopher Morley graduated in December with a Business degree in Accounting. They’re the first to explain that they’ve taken very non-traditional paths in life and in their college education. “We met on a Sunday and got married the very next Saturday,” Chris has often recounted. And while that wouldn’t work for everyone, it did for the Morleys. 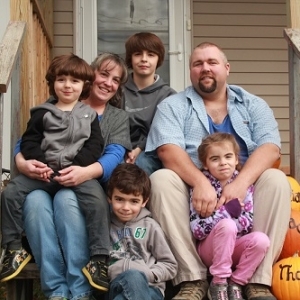 Now both 43 and living in Houlton, their family is complete with Phillip, 15; William, 9; Jacquelyn, 8; and Thomas, 6. Chris started his college career in Orono before he and Jessica met. 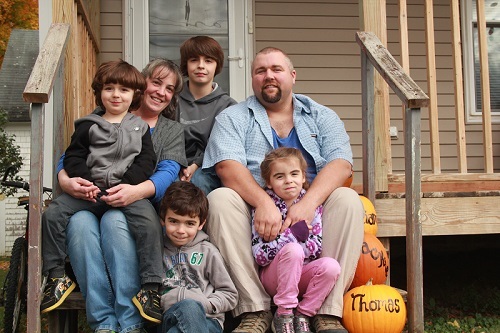 Jessica started her college work in 2012 in Northern Maine Community College’s Nursing program after Thomas was born. After completing all of her prerequisites but finding she’d have to wait two years for an available spot in the program, she decided to move forward with a Social Work degree at UMPI. She’s been a full-time student for the past year and a half. Chris works at the post office in Houlton and was also a full-time student for the past two years. He took as many online classes as possible, including through the University of Maine at Fort Kent and the University of Maine at Augusta, to help with juggling schedules and travel time. Staying organized and finding a way forward, he said, was the name of the game. The couple said having faculty advisors who were accommodating and focused on their success was a big help, too: “Getting through to graduation, I relied pretty heavily on my advisor Stacey Emery for guidance,” Chris Morley said. With commencement just days away, Chris is looking for best ways he can apply his new degree, and Jessica is taking a short break before starting the Master’s in Social Work degree program through the University of New England in August. While Chris was on the fence about actually marching in commencement instead of sitting with family in the audience, both agreed that, in the end, it was important for their children to see the end results of all their hard work. During UMPI’s commencement, graduating students will receive a lapel pin depicting a snowy owl with its wings outstretched in flight and they’ll be asked “Where will your wings take you?” Ask any member of the Morley family and they’ll tell you: it’s far, as long as you’re willing to work for it.